Lewes Football Club is asking fans to bring along food items to donate to local food banks to the games on the weekend of 1st and 2nd December. It's estimated approximately 14 million people in the UK currently live in poverty and Food Banks are critical service for people simply to survive. Food Banks use is wide-ranging and includes those on low income, victims of domestic abuse, lone parents and those unable to work because o fphysical or mental disability. The Club would be extremely grateful for any donations our fans are able to support its local community. 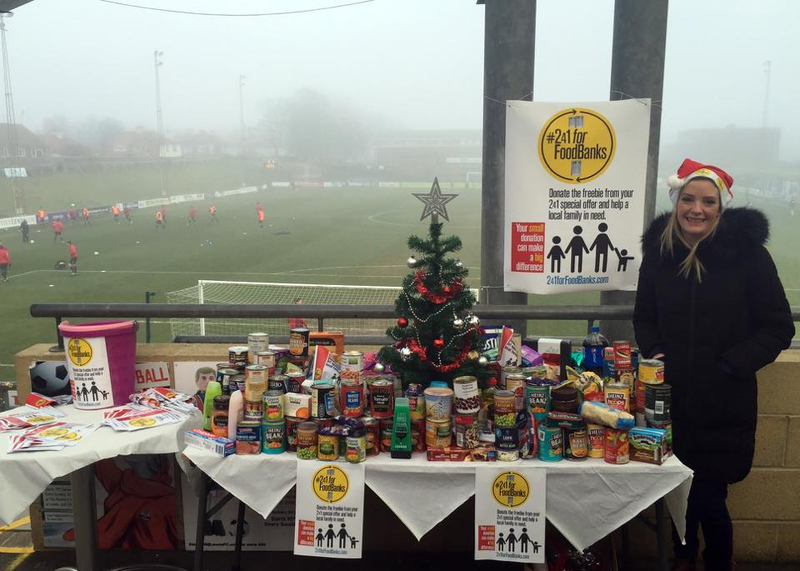 LewesFC has been supporting Emily Clarke’s #241forFoodBanks campaign since it launched here at The Dripping Pan in December 2016. The incredible Rooks fans, as well as visiting fans from other clubs, have donated more than 1,600 items at Christmas collections since then, which all go directly to the three food banks in Lewes, supporting families in crisis. Emily started the appeal for two reasons, to raise awareness of the hidden food poverty in what is perceived to be an affluent area in the south east and to boost donations to local food banks. #241forFoodBanks encourages shoppers to donate the free item from their supermarket 2 for 1 deal to their local food bank. Since the launch, Emily has given talks at the local primary school and they now have a 241 collection day every term. Local businesses have had in-store collections and Lewes Labour has a hugely successful regular collection at its public events. Since2016, there has been a notable rise in the use of food banks in our town. There are now over 240 people relying on 3 food banks to nourish themselves and their families across our town. Nationally, there has been a worrying increase in food bank use and rent arrears in areas where Universal Credit has been introduced. Shockingly, nearby Hastings has reported a 75% increase in food bank use since Universal Credit rolled out there. Emily, who works for a charity in Brighton supporting young people at risk of homelessness, has this year trained 15 volunteers to offer support to people with their Universal Credit claims. The volunteers are from a variety of backgrounds including food bank managers, councillors, tenants' and residents' associations. They are able to offer a confidential space, a secure laptop and internet connection and some guidance on filling out the daunting online application form. While the causes of food poverty can be put down to a variety of reasons, including the disparity between wages and living costs, long term illness and disability, unemployment or unstable employment and welfare reform, the support and intervention in the community to help our neighbours who are struggling is ever more important. On Sunday, Lewes FC will be playing Manchester United in an historic game. Not only is this a huge match for our women’s team and the Equality FC campaign, it's a fantastic opportunity for a community football club to spread the word and offer our support once again to an urgent community response to poverty in our town. On behalf of the Club and Emily, thank you for your support.